It is 2011. Your client is using a recent update of a popular web browser. What does it tell your end user about your web application if they’re using the latest version of Firefox and the application directs them to a dead-end page that states you must use Netscape Navigator 4 or newer? Make a point to check your old web applications periodically to make sure they are keeping up with the times. Dealing with customers can be incredibly trying and can require an enormous amount of patience and understanding when interacting with them. Sometimes it can be assuring to know you’re not alone. For examples of other tech’s interactions with end-users, take a break, check out Clientcopia. Near line 65 of wp-itunes.php, adding the PHP addslashes command, as below, will fix the problem with those songs. The :@ at the start of the URL are if you want to password protect the URL submission with an .htaccess file, for example. If you enter in a username and password in the ‘Recent iTunes’ Upload configuration, you’ll see them in the URL as they are posted. I got it to work with just the ‘index.php’ URL on the upload page, and all the parameters placed in the ‘templates’ page with ‘Get Args’ selected. I wrote this haiku a few years ago as I was testing fiber trunk lines between two campus buildings to locate a suspected break. Setting up my CCNA Lab routers this evening. 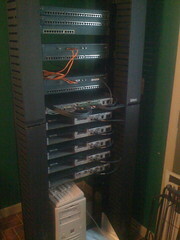 Have everything mounted in the rack and cabled together. At the core of the set up, I have a 3620 with an async card in it that gives me terminal/console access to everything in the rack without having to swap the console cables around. I just telnet to a specific port off the 3620 to access a particular device. Here are some shots of my current set up. 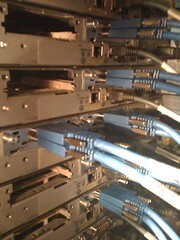 First shot is a close up of the octo-cables coming out of the Cisco 3620. Each line goes to a serial interface on other equipment in the rack. Right now, I’m using 10 serial lines. The interface here supports up to 32 serial lines — so I’ve got a bit of room for growth. 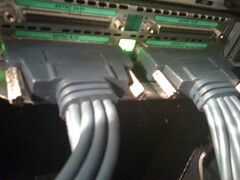 The next shot is the inter connecting serial DTE/DCE cables between each Cisco 2600 router. The router with four serial interfaces is connected to four separate 2600’s — one, two, three, and four. One and Two are further connected to each other, as are three and four in this particular set up. 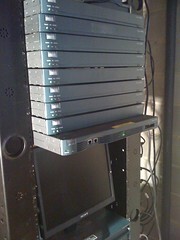 Finally, here are two shots, one of the front of the rack and another of the rear of the rack. Below the routers is a shelf where I have a couple of Linux boxes that I use as nodes on the networks for testing connectivity between different router setups/configurations. Just a quick note to update my status… got a new job at Unifi, Inc., sold house in Freeville, NY, moved to North Carolina, bought house in Kernersville. 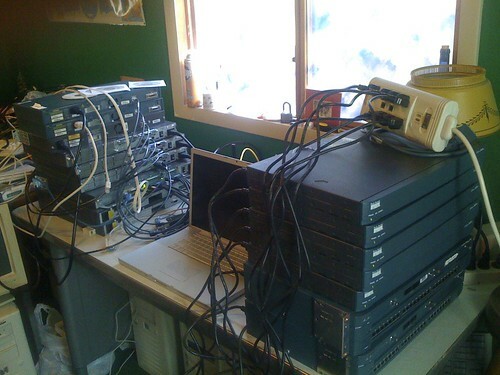 I’m building a lab at the house to use to study for CCNA and CCNP certification. 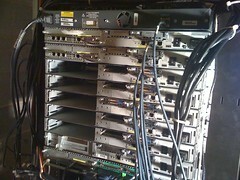 On the left are some old Cisco routers and switches scrounged from work. On the right are some routers and switches I bought on eBay. I have a Cisco 3620 with an Async cable connected to all of the console ports so I can access all of the systems console ports thought the 3620. It’s just about ready to go — I’m just waiting for an order of DCE/DTE crossover cables to arrive and then I’m in business. I hope to be able to get things set up so that I can administratively reconfigure the systems without having to make a lot of patch cable changes to create different scenarios… we’ll see. Finally, in the bottom left corner, is an Ubuntu Linux system I’m using for general management of the switches. It’s got tftpd set up, and can receive syslog messages from the systems if I need to do some heavyweight log troubleshooting. Eventually, I hope to get it set up as a TACACS server as well. Update #1 — mounted the equipment into a rack that was donated to this cause. 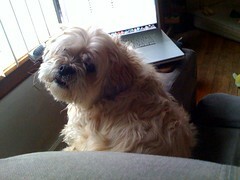 I’m testing auto-blogging via Flickr from my iPhone.